Is your pool water being a real itch? Swimming should only be a good time. If your pool water is irritating your skin it’s time do something about it – stat! Firstly, if you have super sensitive skin, it’s essential to shower straight after swimming in a pool, washing off any chemical residue. Now when it comes to perfect pool water, the secret is balance. Unbalanced pool water can irritate a swimmer’s skin, so it’s important that you’re on top of your pool chemical use! Chlorine is the real MVP – working its little heart out to sanitise the water we swim in. Our friend chlorine goes above and beyond to get rid of all the nasties so that we can splash all day! While chlorine is our best buddy, it’s crucial we don’t become too liberal in its application. Chlorine can irritate a swimmer’s skin. Therefore, you should only add the recommended dosage of chlorine to your water. Regulating the application will ensure that chlorine’s cleansing potential is maximised without compromising your enjoyment! We recommend using BioGuard Lite for regular sanitation and shocking for your pool. To prevent your application from going overboard, we recommend having a chat with your local BioGuard Approved Retailer about the best use of the product. Taking a moment to learn about the optimal use of our products equals healthy pool water and happy swimmers. 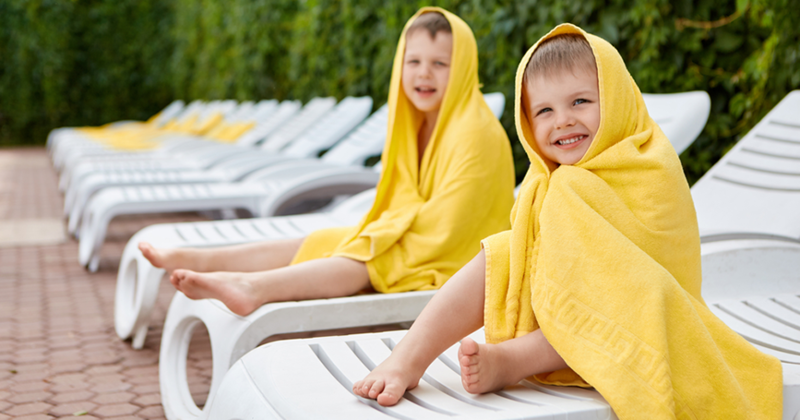 Another factor that can contribute to itchy skin after swimming is not using an oxidiser with the chlorine treatment of your pool. The role of an oxidiser is to keep the pool water sparkling and clear of impurities. It also removes chloramines which is the chemical compound produced when chlorine attaches to the unwanted wastes in your water. Chloramines are often the cause of eye and skin irritation to swimmers, and their unpleasant smell is falsely blamed on chlorine! So, using an oxidiser when adding chlorine to your pool water will help to keep it comfortable for all swimmers. We recommend using BioGuard Oxysheen in conjunction with BioGuard Swim Clear. It destroys organic wastes and eliminates odours. But do you want to know the best feature of BioGuard Oxysheen? After its use, swimmers can be back in the water after an hour! To avoid itchy skin after swimming requires consistent maintenance. But don’t worry, we’ve made it easy for you, with maintenance programs for all pool types. Head to your local BioGuard Approved Retailer to receive step-by-step instructions on how to get your pool water healthy and sparkling! They’ll give you all the handy hints on products such as BioGuard Algi Destroyer to remove unwanted algae spores and BioGuard Stabiliser to maintain your pool’s water balance. A properly maintained pool is key to comfortable water. Say goodbye to irritation and hello to hours of fun! Now you’re all set to get rid of the itch and swim in comfort! If you’re after some more helpful tips, be sure to head into your local BioGuard Approved Retailer or visit our Facebook page.